My friend, Natalie, made these muffins the other day. They were so good! I got the recipe from her and made some tonight. The original recipe is found here on Allrecipes. Here is my version of the recipe (since I can't seem to follow a recipe). 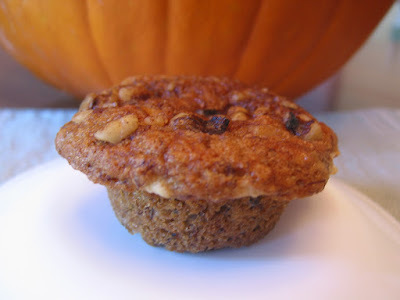 My favorite part of the muffin is the little cinnamon/sugar/crunchy walnuts on the top. I usually don't bake with nuts, but these are yummy! Mix flours, baking powder and soda, and salt together. In separate bowl mix banana, sugar, egg, vanilla, applesauce and butter. Add dry ingredients. Stir until just mixed. Scoop into lined or greased muffin tins (makes 12 regular size muffins). Mix 1 T. melted butter, 1 T. sugar (either white or brown), 1/2 tsp. cinnamon and 1/3 c. walnuts. Sprinkle coated nuts on top of unbaked muffins. Bake for 25 minutes at 350.